With the changing of seasons, comes the changing of styles. Summer gives women and men the opportunity to be adventurous and causal with their hair, while still looking professional in a business atmosphere. Keeping up on the latest trends can be challenging, however there are a few simple suggestions to keep in mind when planning for a summer hairstyle or wedding style. In past years, hairstyles have been very predictable with neat and precise angles and layers. This summer styles are shifting towards an “anything goes” sort of attitude. Bob cuts have slowly drifted back into the trends and are a great summer hairstyle. The bob NOW “the LOB” gives the client the opportunity to have one length hair or various lengths in layers, along with volume. The Lob styles are great because they can be personally tailored to the facial structure, the personality, and the style of the client. Shifting from the cold and dark winter months is made easy by adding highlights to a fresh summer style. Highlights give the hair a warm dimensional look, while keeping it looking natural. Stylists have the ability to sporadically place the highlights to complement the style and facial structure of their client. Over highlighting hair may become overwhelming, however it is necessary to keep up on unruly roots. Finally a quick update to a hairstyle can be as easy as adding bangs or texture to a hairstyle. Bangs can make a statement by being either elegant or bold. They can become unique by personalizing them to a client’s needs, personality or style. Adding texture to a style can also give it a whole look without taking away from the length of the hair. Each update can be simple and business-like but can be styled differently for a night out on the town. Planning a wedding does not have to be stressful, that’s why Casual Chic Salon An Azemi® Company designed a wedding countdown program for the bride-to-be to eliminate the pressure of planning. Although it is tempting to select an updo that fits the current times, it is suggested that the bride-to-be opts for a more classic style. Curls and waves that are loosely pulled back give hair a romantic and classic look. Embellishments such as hairpins, tiaras and combs help to finish the updo by accenting the dress. One of the biggest trends for the summer is a classic, the braid. Braids help to maintain and manage frizz while giving the hair a chic appearance. However, it can be worn a variety of ways. Of course brides have the choice to wear a tight braid to manage the hair, but the braid can be worn more loosely giving of a light and romantic look. A great way to finish the braid is by adding embellishments. Some other summer trends that are more playful are the bun and the ponytail. The classic ballerina bun is tightly wrapped towards the top of the head, but can be altered by lowering it to the bottom of the hairline and wrapping it more loosely. As for the ponytail, pulling it slightly to the side and adding loose curls can give it a more elegant and sophisticated look, while still maintaining a more relaxed feeling. 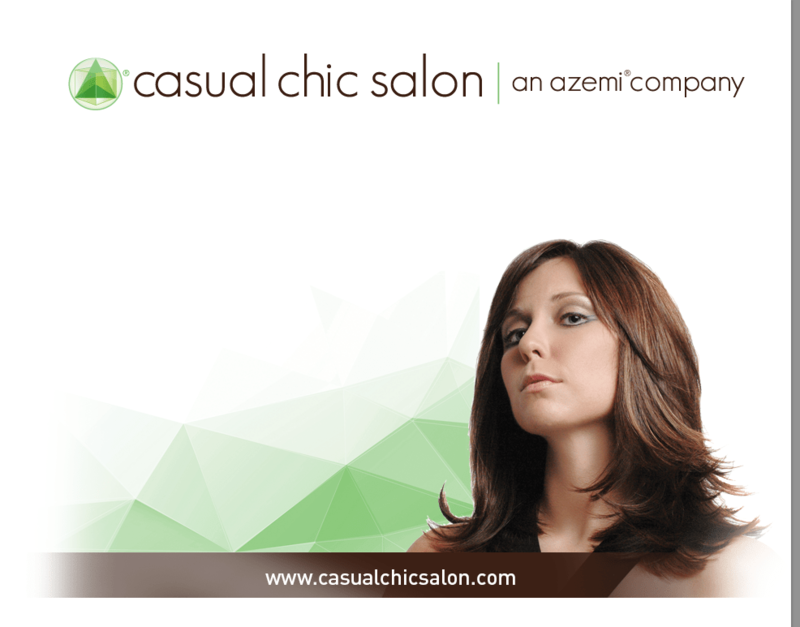 Casual Chic Salon An Azemi® Company recommends a 12 week beauty program to help guide the bride and bridal party to the big day. Check out www.casualchicsalon.com and click on wedding countdown for more information on the services.